Plagron Terra Grow is a highly concentrated bio-based mineral nutrition, to use in the growth of the plant. This liquid fertilizer provides an optimal fertilization during the growing. It provides a solid foundation so that the plant at a later stage can fully bloom. Terra Grow is suitable for all types of soil mixtures and can be used with all liquid fertilizers and additives. 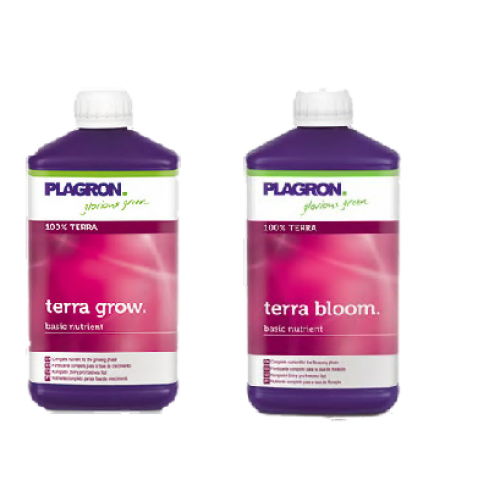 Plagron Terra Bloom is a highly concentrated bio-based mineral nutrition, to use in the flowering stage of the plant. This liquid fertilizer ensures optimum fertilization during flowering and supports and promotes flower formation. Terra Bloom is suitable for all types of soil mixtures and can be used with all liquid fertilizers and additives.